We are located between Pézenas and Montpellier, not far from the Mediterranean (10 km). The story began in 1892 in St Pons de Mauchiens, near Domaine de Nicole, where today, the Château in Montagnac is to be found. Jean-Claude Mas started Domaines Paul Mas there in 2000 from 17 hectares of family land and it is where the legend of Vinus the heron began! Our vineyards cover an area between l’Ile de Conas (39 ha), Clos des Mûres and Savignac, the vineyards of Nicole in Montagnac (81 ha) and Clos de Moulinas (42 ha) in Caux. Grape varieties planted there include Syrah, Cabernet Sauvignon, Mourvèdre, Carignan, Grenache noir, Grenache blanc, Merlot, Cabernet Franc, Cinsault, Marselan, Viognier, Chardonnay, Sauvignon blanc, Pinot blanc, Piquepoul, and Vermentino, that allow us to produce our ambassador wines: Clos des Mûres, Belluguette, Moulinas and Savignac as well as the red and white Paul Mas Grande Reserve wines. Yields vary between 35 to 60 hl/ha. Heavily influenced by our gravelly clay and limestone soils on the hillsides of the Hérault Valley, as well as the chalky, fossil rich soils on the hills running down to the Thau marshes, our wines, whilst extremely charming, are robust in character. They express a strong sense of their terroir in the Jean-Claude Mas style. Our wines are produced from the Languedoc, Languedoc Pézenas, Grés de Montpellier and Pays d’Oc appellations. The vines are grown using sustainable viticultural practices, certified Terra Vitis and organic. We carefully follow the basic principles of biodynamic wine production. The pruning methods used are Cordon de Royat and Guyot simple. A combination of hand and machine harvesting is used. Our vines enjoy a north, south and west-facing exposure, cooled by the Mistral and the Tramontane winds in an exceptional setting surrounded by olive trees and pine forest, oak trees and orchards. All these factors give the grapes their unique flavour profile. Château Paul Mas hosts collections designed by unbelievable talented local and national artists and craftspeople: wood workers, mosaicists, textile artists, watchmakers, painters, interior decorators, and so on. These beautiful works of art are a key part of the setting in which visitors can discover our gastronomic treasures and wine tourism. The wines are made and aged in cement or stainless steel tanks or in small oak barrels as well as standard size French or American oak barrels. 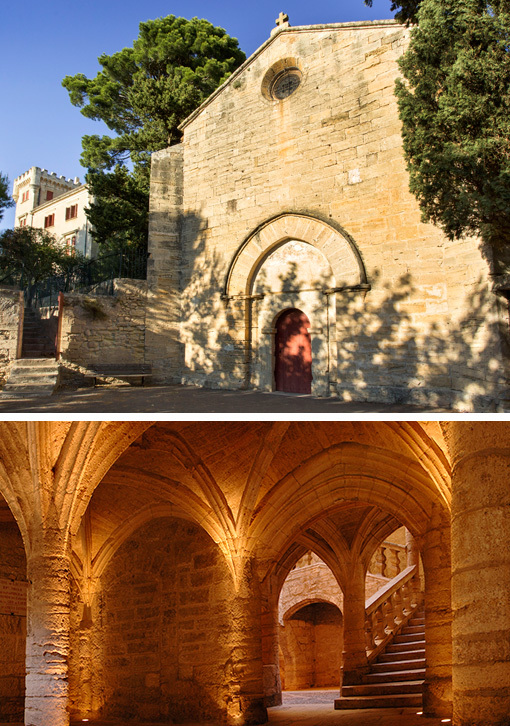 Nowadays, some stunning architecture is a reminder of Pézenas’s rich historic past. And as one epoch succeeded another, so did vines play a greater or lesser role in 27 centuries of history. In the shape of a 24 km long triangle, pointing downwards, the terroir’s eastern boundary is the south flowing river Hérault. To the north it’s sheltered by the Black Mountain, whilst its south-western ground is an extension of the Béziers area. The altitude varies from 0 – 300 metres with vines at all levels.